LOVE these guys, reasonable price, and tasty hot food. They are friendly and make great tacos!! Always choose this truck when I see it on the street outside work! I thought the bbq chicken taco was exceptionally good. The beef tacos were good, but not exceptionally so. The tacos were large, so three made a full meal. Service was friendly, and I would definitely eat here again. Normally I would give it 5 but today they screwed up my order and instead of a chicken taco I got a fish taco and I really don't like fish tacos at all. Agree with previous reviewers. Best tacos I've ever had. Bought these tacos and love them!!! They are the best! I loved them so much, that after three I went down bought three more and ate those, too! GREAT!!! Greatest tacos I have had in my entire life. I ordered 2, ate them in my car and had to go back for more to save for later in the night. You can see it is extremely clean and well kept inside the truck, they are friendly and fast. The soft tacos were fresh, the meat was tender and the toppings were in perfect proportion to the taco size. Their extra *hot* hot sauce is a great flavor addition if you're up for it. once i found bus center dr, i went straight to your handsome truck. a ten minute wait while i sat on the lawn with some chicas, and I got a yummy fish taco. at 130pm after the mri, i returned, i got the veggie taco, but all the chicas had gone back to work! This was my first time trying this truck. I work in Tyson's Corner and was very pleased to see a new lunch spot. The steak tacos were off the radar!! The tacos were excellent! I topped my chicken with guacamole, tomatos, jalepenos, and cilantro. They didn't go overboard on the toppings (just the right amount!) so it made for a light and flavorful lunch! Will go back again. 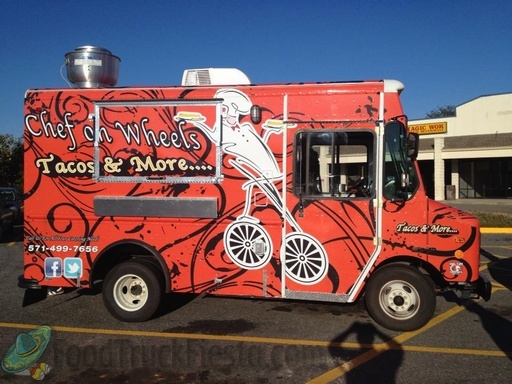 Chef on Wheels is permitted in Arlington, Fairfax and now DC (June 2013)! 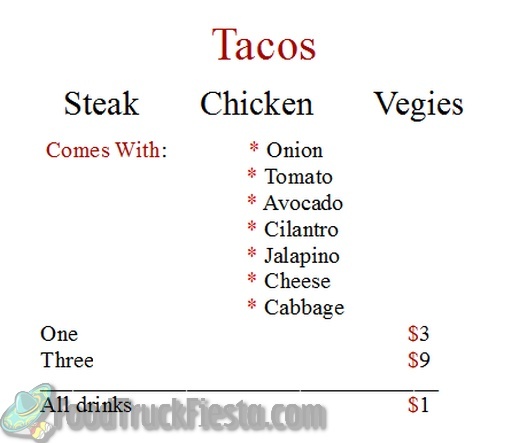 They serve tacos!